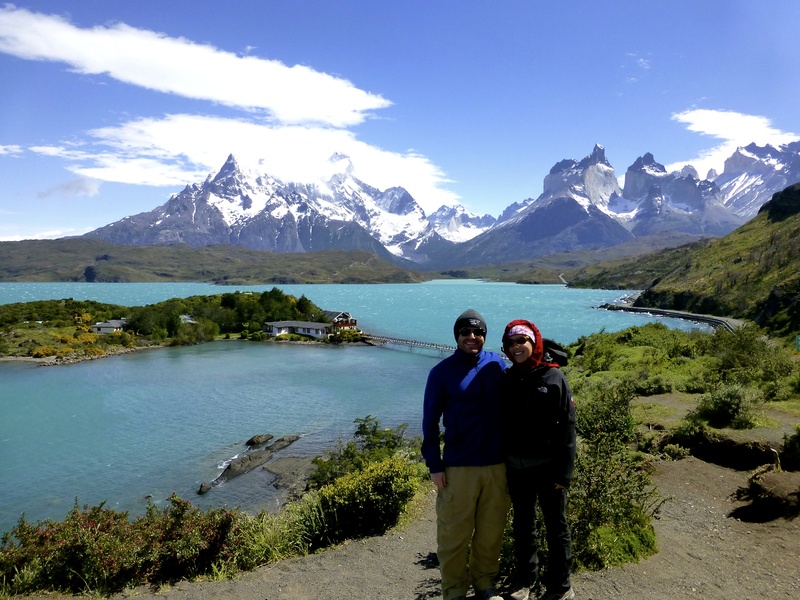 We spent five nights in the Torres del Paine area of Chilean Patagonia. The scenery is jaw-dropping and our activities consisted of two full-day hikes, a scenic tour of the whole park, some lighter walks and an afternoon horseback riding. Since we booked Chile when we planned to maintain gainful employment and take no other major trips for the year, our accommodation at Tierra Patagonia was a massive splurge. 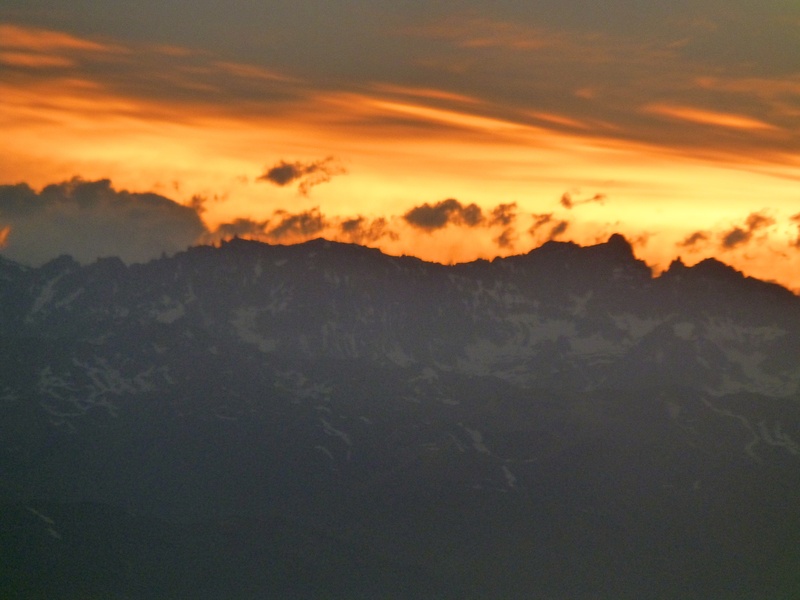 Our early morning flight from Santiago to Punta Arenas afforded superb views of the Andes mountains at sunrise. I could not get a good look out the other side, but I think it is preferable to request seats on the left side of the plane when facing the front. Punta Arenas airport is small with one terminal, and we were met promptly by a representative from Tierra Patagonia. Over the next four hours we became acquainted with the 12-person Ford vans that would be a constant presence during our time in Patagonia. We also met our new friends Kenneth and Dawn from North Carolina and Karl and Amanda from Chicago. Kenneth and Dawn provided the two best lines I heard down there. First, they dubbed the delicious cereal bars that Tierra Patagonia makes “Guanaco logs.” Second, Dawn said that Kenneth refuses to call it the NASDAQ and instead refers to it only as the NADSAQ. It goes up or down, and you cannot control it. Brilliant. Light lunches were provided and we stopped halfway at a roadside restaurant for coffee and baños. If you are going to nap, it would be preferable early in the trip as the views become progressively better. It is nearly always windy, and the landscape is rugged with sparse tree cover. Parts of the drive are near the ocean (on either side) and we made a quick tour of Puerto Natales, a neat town of about 20k with several outdoor outfitters and accommodation options. It is the last substantial outpost before Torres del Paine, and one could probably organize tours and treks from here. The Singular hotel is nearby and while I am not sure the desirability of this location given its distance from the park, I heard great things and especially regarding the cuisine. When hiking the Base del Torres, we saw a couple from there so day trips are doable and it may be convenient to certain other attractions. Closer to Tierra Patagonia is the tiny outpost of Cerro Castillo, at the border with Argentina and where the road splits off to El Calafate where I am told the Moreno Glacier is wonderful. A bit beyond here the road turns to dirt, and we would not touch pavement again until our return trip to the airport. The entrance to the hotel property is unassuming, in keeping with the structure’s design to blend into the landscape. A few minutes driving on a rougher dirt road passing many sheep and lambs and the occasional rhea or rabbit and we arrived at the hotel, set back a distance from Lago Sarmiento. Note that Tierra Patagonia is actually outside the national park and driving times to certain excursions are longer, but this is not necessarily a disadvantage. See my comparison vs. Explora below for more on this. This place is truly spectacular. And it will be difficult for me to limit my use of that word when describing the next few days. The hotel is a modern, undulating wood building with incredible views from the public areas and all guest rooms of the Paine Massif across the lake. Styling reminds me of Scandinavian with light woods and clean lines. Our spacious room (#32) was on the second (top) floor. I believe all the rooms have amazing views, and I think the main decision is whether you want to be closer to the entrance, lounging and dining area or closer to the hot tub, pool and spa. WiFi is available but only in the common area. Tierra Patagonia is all-inclusive, except for a few excursions and of course spa treatments. Breakfast is a nice spread of fruits, meats, cheeses, toast and jams and scrambled eggs and cooked ham. It is more than adequate though not over the top, i.e. there is no omelet station nor raw bar etc. Lunch at the hotel is a proper three-course meal, though if you do a full-day excursion your lunch will be packed and ample to satiate any appetite but less luxurious. Dinner is also a proper three-course meal with three options each for appetizer and entree and two options for dessert. The appetizer options always include one soup, one salad and something else, perhaps a tartare or carpaccio. The entree options were typically some combo of pasta, fish or meat, plus always a vegetarian option. Dessert is either fruit salad or some tart or dairy based item. Overall, I would say the food was very good and at times great but not consistently great. I am being rather picky given the extreme pricing, but this is not the place to come for the best food of your life. All alcohol is included except for certain premium brands, which we never even considered. The house pinot noir was excellent and the carmenere was very good. I enjoyed the Austral Calafate Ale which has a slight blueberry flavor, like the calafate bush. There was a specialty cocktail each day, usually pretty tasty. There are morning and afternoon half-day excursions, as well as full-day excursions. As one might expect, weather is a big factor down here. Clouds and wind can have a major impact. Some visit for days and never see the iconic Torres (for which the park is named) fully exposed. Calm air seems an even greater rarity. We were lucky and enjoyed clear views to start and a couple other days. Lakes and rivers feature prominently, some more green/grey and milky from the glacial silt and others turqoise blue like tropical seas. Clouds often appear like UFOs with oblong shapes and flat, darker bottoms. I was surprised to learn that neither the elevations nor latitude are what I had imagined. The park sits around 51 degrees south, the equivalent of parts of Europe. It is nowhere near the Antarctic Circle. It is also pretty much at sea level. Thus, the mountains are spectacular and some rise 10k feet, but that means the highest peak is only about 10k feet. The tops of the Torres are no higher than Guadalupe Mountain in Texas. Our first afternoon we chose the Laguna Azul excursion. On the drive we saw countless guanacos and stopped at the Laguna Amarga, a salty lake tossing about in strong winds. The Salto (waterfall) Paine backed by the Torres was magnificent. At Laguna Azul we walked around a bit, saw some interesting birds and learned of the calafate bush which serves as an amazing shelter from the wind. Inside a hut was coffee, tea, hot cocao and pisco sours, with a tip requested in return. On the ride back to the hotel we saw a rhea (aka ñandu) running with an adorable baby about the size of a chicken. We also saw several flamingoes down here, which was quite surprising as I had associated them with warmer environs. Tuesday was a glorious day so we wisely decided to get straight to the most famous hike in the region. Look at the amazing reflection in the Laguna Amarga and the contrast between yesterday (windy) and today (calm). After a 45 minute drive we arrived at the Hotel Las Torres (more in the accommodation section below). Here and stretching well past the Campamento Chileno is the only private property inside the park, and what an astounding piece of real estate it is! Fortunately the owners do not exact a toll on those passing through. The trail crosses a river on a suspension bridge with a max capacity of two before ascending to the top of a hill and then descending to the Campamento Chileno. On the river just past here we saw a lovely male Torrent duck, so named because it apparently can swim up waterfalls. We then hiked through forest before coming to the most challening part where the path becomes exposed and rocky. At the top is a small lake and stunning, head-on views of the Torres. We ate lunch here and fortunately the setting was so majestic that the brutal winds did little to dampen our enjoyment. On our descent the trail was even more crowded. I cannot fault others for doing the same thing, but this is not where you come for solitude. It is difficult to recall a more crowded trail I have seen. Of course in this area layers are key, because a lightweight shirt may be appropriate for the ascent while a jacket, hat and gloves are desired at the top. I think the stats are 11.3 miles roundtrip and 3k vertical feet. Some difficult footing and strong winds make this a harder hike than the numbers suggest. We began at 9:45 am, summited at 1:30 pm, descended just before 2:30 pm and returned to the van at 5:10 pm. Wednesday got off to a rocky start as most excursions were canceled due to the wind and there was a bit of miscommunication between ourselves and the hotel. We ended up on a half-day excursion in a van with just ourselves and Jocelyn (Josy) and saw more of the area east of the park. Big, unpopulated valleys with nobody else other than a couple gauchos. We passed a herd of cattle being moved from Hotel Las Torres to their summer pastures and then met Jose, who invited us to spend more time since he is always alone out here. Though we never did the hotel’s exclusive excursion to a ridge where condors are often seen up close, today we saw about 10 flying nearby. The younger lads have less white on their wings, and Josy said these giant birds can live 50+ years and may commit suicide when old and weak by plunging head first. We ended our drive at Estancia Las Chinas and crossed a wooden bridge over the milky Baguales River lined with wind-gnarled trees. We walked up the hillside in heavy winds and saw guanacos, a horse carcass, massive views and zero humans. This felt very “Patagonia” to me. Jenni was sick a bit of our time here and not that interested in horseback riding, so she rested up while I went on an afternoon excursion to Estancia Lazo. I am not much of a rider but decided to brave the cold, windy weather for this unique experience. On the hour-long drive there I saw Lago Sarmiento from a different side. The horseback tour was by Laguna Verde, and we ascended to a lookout though it was fairly socked in so mostly the scenery was forest. After two hours, I was thrilled to see an owl up close and get off that horse and into a heated van. To give Jenni an additional recovery day, we postponed the French Valley trek and instead did the full day tour of the park. I am happy we did so because it was a perfect day and the scenery was spectacular, enhanced by some snow at elevation last night. Plus, I had indulged heartily the night before with Kenneth, Dawn, Karl and Amanda. We stopped at some viewpoints and then walked a short way to Salto Grande, a nice waterfall in an incredible setting backed by the Paine Grande and Cuernos. Paine Grande has four separate peaks, including the highest point in the park, and it is partially covered by hanging glaciers. This is where the Mirador Cuernos hike starts and is just past the boat (that we would take tomorrow) to Refugio Paine Grande, the starting point for the French Valley and Grey Glacier treks. From here we continued around Lago Pehoe to a classic lookout above Hostaria Pehoe, next crossing the Weber bridge and lunching inside by Rio Serrano, the most developed area of the park. 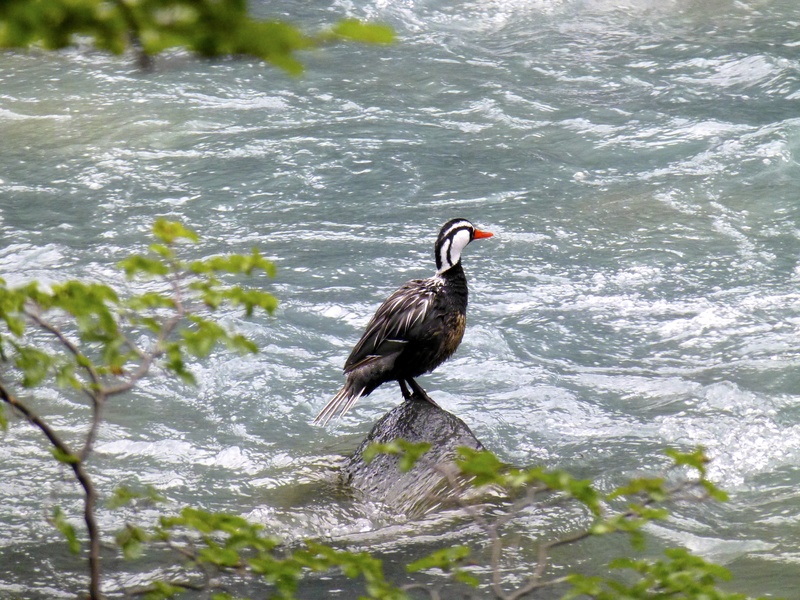 I believe one may kayak around here or take a zodiac to Bernardo O’Higgins National Park, the largest in Chile. Lunch was a great spread of meats, cheeses, soup, lox, quail eggs, etc. And some glasses of carmenere and Cabernet Sauvignon. One of the delights of a day mostly driving is that wine is anything but verboten. After lunch we drove to Guarderia Lago Grey where we walked across another wooden suspension bridge on the Rio Pingo to a short path leading to a huge gravel beach we crossed to arrive at a path cut into the rocky hillside ascending to the Grey Glacier lookout. Quite the spot, with a massive glacier across the lake, icebergs floating nearby and in-your-face views of Paine Grande and the Cuernos. Josy treated us to some calafate sours, a maroon take on the pisco sour. Legend has it that he who drinks the calafate sour will return to this land. There is a boat ride offered here that takes you up close to the glacier but I think it costs $110/person. Word is that especially if you have seen the Moreno glacier in Argentina then this is not worthwhile. On the drive back to the hotel I asked to stop at Explora to check out Salto Chico and get a better sense of the property. More on that below. I strongly recommend the full day tour to anyone with enough time, as we saw so much of the park and it was beautiful. If I could not spend Thanksgiving eating turkey, watching football and drinking scotch with my family, then this is how I would want to spend it. A little FaceTime with Mom’s side at Leslie’s house was nice, as was the Johnnie Walker Black Label on the rocks to make me feel at home. For our last full day we did the French Valley trek, another classic. Josy again led us, and we were joined by Iana and Rich. In another small world occurrence, they are both New York based restructuring professionals and we have some mutual friends. On the drive to the boat Jenni, from the left side of the van, had a legendary spotting of some baby grey foxes on the right side of the road. The driver backed up and we enjoyed just about the cutest creatures I can imagine! 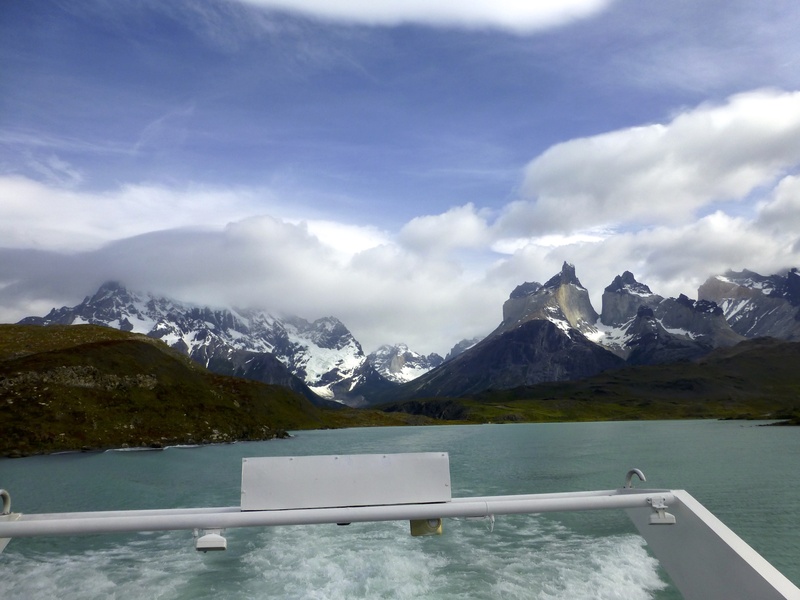 We took the 9:30 am boat across Lake Pehoe and hiked a trail past wildflowers with views of the Cuernos, the French Glacier and turquoise blue Lago Pehoe. The hike ascends modestly until the Campamento Italiano where it steepens heading up the valley towards the Campamento Britanico. We enjoyed a nice lunch spread (hot soup, veggie skewers, hard boiled eggs plus individual sandwiches and snacks) on a boulder overlooking the glacier and valley. After this we continued a bit but did not reach the top as we conservatively turned back at 2:30 pm to ensure we did not miss the 6:30 pm boat back across the lake, after which you are stuck until the morning. Josy had brought a cooler to wait for us at Refugio Paine Grande, and cold Austral cervezas went great with conversation about skiing in different geographies. There are a host of options, including the basic decision whether you want to trek from one refugio (or campsite) to another or sleep in the same bed each night with daily excursions. 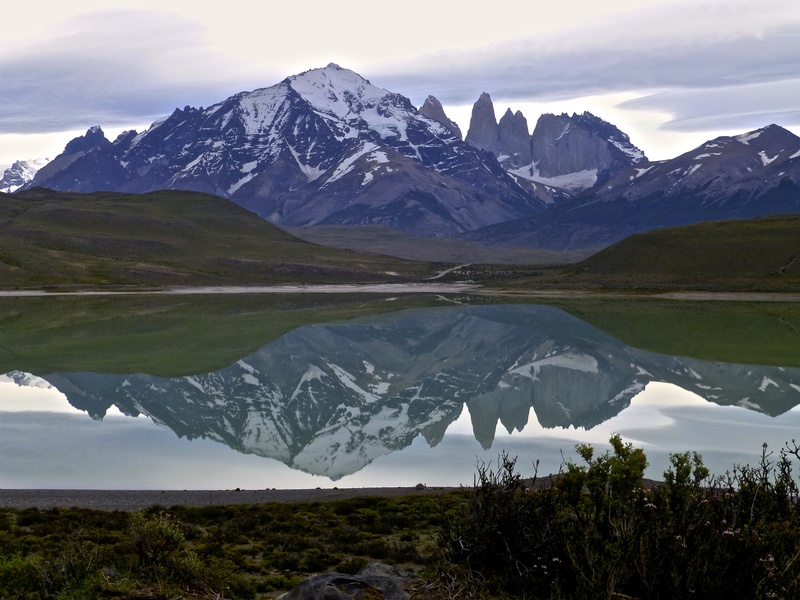 For more avid trekkers, the classic route is the “W”, which I believe goes in whichever order from Refugio Grey to Paine Grande to the French Valley to Base of the Towers and ending at Hotel Las Torres. There is no single way to do this and various hike and accommodation combinations are possible. You could arrange this on your own or go with any of several operators offering assisted treks, ranging from help booking lodging and meals to fully guided treks. Really serious trekkers can opt for the full Paine Circuit, a 7-11 day adventure where I would assume solitude is on offer for the non-W portions. If you prefer to stick with one base, there are several different areas to stay. I cover Explora and Tierra Patagonia below. It seemed like Rio Serrano is the most developed area, but that is a very low bar. Names of properties I recall include Tyndall, Rio Serrano, Paine Cabins and Lago Toro, and I think a new lodge is being built by the river. There is more grass here and lovely views of the Paine Massif. Hotel Lago Grey is on the lake but you’d need binoculars to see the glacier well. Hostaria Pehoe is an older place but the location looks spectacular, jutting into the lake in between Explora and the mountains. Camping Pehoe is nearby. My friend Leila stayed at Hotel Las Torres and liked it a lot, and this would be the ideal location for maximizing your chance of catching the Torres on a nice day. You walk out the hotel and onto the Base del Torres trail. Anyway, the thing to remember is that trails are somewhat spread out and roads go around lakes and mountains rather than through them, and some accommodation is accessible from the road while other requires a boat ride and/or hike. As best I can tell, if you seek the all-inclusive luxury experience then you are deciding between Explora and Tierra Patagonia. We strongly considered the former, but Explora is much less flexible in that it requires either a four or eight night stay and only beginning and ending on specific dates. I did not see the inside of Explora so cannot offer a completely informed analysis, but my understanding is that Tierra Patagonia is nicer. The main advantage of Explora is its location inside the park, perched above Lago Pehoe with extraordinary views of Paine Grande and the Cuernos. These mountains are so much closer here, and it is a more awe-inspiring view. When on Explora’s property you really feel that you are set amidst the grandeur of it all, whereas at Tierra Patagonia you visit for the day and then enjoy expansive views from a safe and luxurious distance. Explora also has its own boat leaving right from the property, which means access to the trailhead for both the French Valley and Grey Glacier treks is delightfully convenient and entirely independent of the operating schedule adopted by the boat concessionnaire to which all others are subject. I believe the “public” boat runs only twice a day. Given that these are two of the three most prominent portions of the W-trek, this is nice. That said, on the day we trekked the French Valley, I found the experience of waiting around and taking the public boat among such an international crowd to be very enjoyable. It is also worth noting that the trailhead for Base del Torres may be equidistant from Explora and Tierra Patagonia (check this). The hot tubs and pool at Explora require quite an outdoor walk in what is generally cool and windy weather. Far worse, they are down the hill and facing the wrong direction. I must have seen some annex or there must be some other regulatory or safety justification for not locating these features to enjoy one of the best views anywhere in the world. Otherwise, I hereby demand the immediate drawing and quartering of the designer. Truly baffling. Interior design, comfort and food aside (I know that is a big aside, but I simply cannot compare those aspects), the glaring advantage of Tierra Patagonia is that its location allows for more off-the-beaten-path excursions and means the visitor simply sees more of the area. I found the vast expanses of earthen toned land and hills with virtually no signs of civilization other than the occasional estancia or gaucho to be a substantial part of the appeal. Some excursions are exclusive to Tierra Patagonia, owing to the vastness of its property and arrangements it has made with other owners. 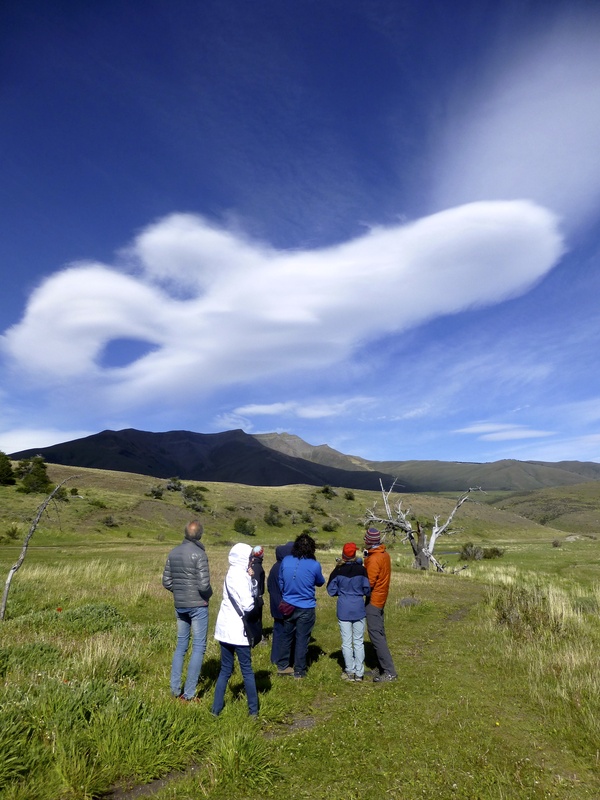 Around Explora we saw zero wildlife, whereas around Tierra Patagonia we saw hundreds of guanacos, tons of sheep and lambs, rhea, lots of birds, an armadillo, etc. And had we been staying at Explora, we never would have seen those baby foxes on the way to the French Valley. Shame on you if you can put a price on seeing baby foxes. Guests and staff were supremely friendly. We made many new friends and it was touching how many people inquired whether Jenni felt better after knowing she had been sick. Ditto the staff who brought her a three-course meal in bed on the worst night, after which just about every one we came across asked how she was. The crowd is predominantly American, moreso than I expected. Most are interesting and well-traveled, just as I expected. Many guides are from Punta Arenas, though Spain, Australia and Turkey (as Jenni would say, woot woot!) were also represented. On Saturday we left the hotel at 10 am which meant a good few hours in the airport before our 5:45 pm flight to Santiago (and 30+ hours of travel time back to Los Angeles). We spent no time in Punta Arenas, though I would imagine this small city of 120k has some interesting aspects. One of our guides said that Sotito’s is the place for king crab. Penguin trips are available to Otway Sound onshore or Isla Magdalena offshore, and perhaps others. The owners of Tierra Patagonia also own Tierra Atacama and the Portillo ski resort. I think they may offer some packages when combining more than one location. Tierra Atacama is in a little town in the Atacama desert, the driest place on earth. Some others had stayed there and loved it, even suggesting the excursions might be better. I think it is at substantial elevation and one excursion is being taken by car up to about 17k feet and then hiking to the top of a volcano. One guest said the geyser excursion is a must. 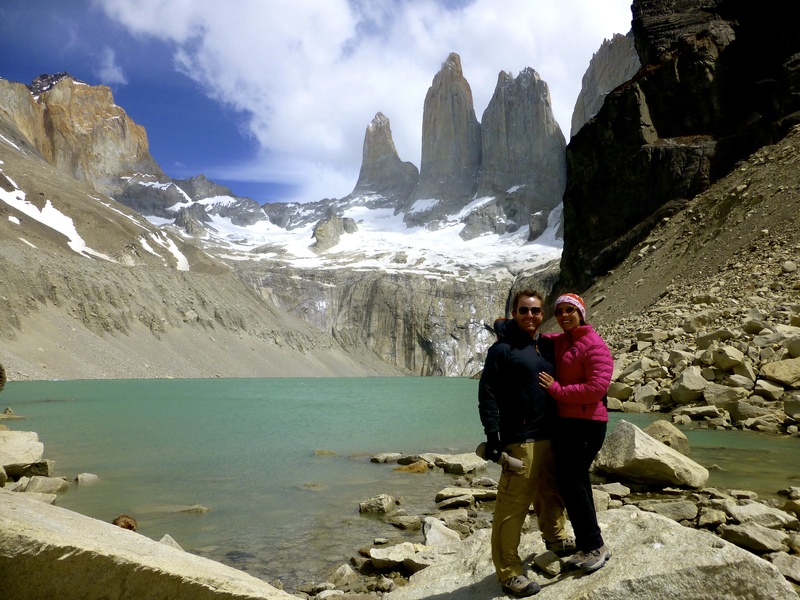 Torres del Paine is quite a haul but the reward is worth the effort! This entry was posted in Chile, South America, Uncategorized and tagged Chile, Explora, Patagonia, Torres del Paine on December 6, 2013 by aleavitt77. I did not realize how many different wine areas are accessible from Santiago, thus deciding you want to do a wine tour is only the first step. The Maipo Valley is close to the city and where the famous Concha y Toro winery is located. I believe one could take the train there and then walk, and La Bicicleta Verde is a popular company offering bike tours. Uncorked also came recommended but their tours are far more expensive. The Colchagua Valley, Aconcagua Valley and I am sure others are alternatives to the Casablanca Valley where we visited. Enotour picked us up at our hotel promptly at 9:30 am in a large van with a total of nine tourists, a driver and our excellent guide, Andres. The group was diverse with passengers from Mexico, Spain, Argentina and Israel (a Birthright executive). On the way to the coast we stopped at a touristy place to sample chicha, which Jenni noted tastes a lot like apple cider. Our guide informed us that copper is Chile’s most valuable export, and other majors include agriculture, seafood, wine (with the UK and China the biggest buyers), wood and lithium. I was quite impressed with Valparaiso. The colors are so vibrant, both the structures themselves and the ubiquitous street art in the roads and alleys covering the hillside. There are several funiculars and we took one up to the fine arts museum. Valparaiso was a major international port and commercial center, particularly before the devastating 1906 earthquake and opening of the Panama Canal which diminished the importance of being the last big port before Cape Horn. This is less true today, but it remains a tourist destination owing to its history, architecture, bohemian character and nearby surfing. Some homes are wood but covered outside with zinc plates to protect against the elements. Cats are all over. I believe Lautaro Rosas is a high-end street, and the Hostals Casa Valparaiso and the Casa Aventura seemed well-located. The Palacio Astoreca is a boutique hotel with the Alegre Restaurant. A brief tour was a treat, and I think this area merits a night or two. From Valparaiso we drove a short way to Vina del Mar, which is more modern and home to Chile’s first casino. Valparaiso is often compared to San Francisco, and Vina would be more akin to Miami (though much slower paced) with its condo towers lining the beach. There is a Sheraton Hotel and Convention Center with a nice terrace on the water, just outside the central city area. Horse and carriage rides are available, with a concentration between the casino and the river. We saw the Reloj de Flores and outside the Museo Fonck sits one of only four Moai in the world not on Easter Island. There are a couple well-regarded universities in the area. Andres explained these are expensive, with tests taken at the end of high school determining what school you can attend and how much of the cost will be government-funded. He also said he lives in Vina and commutes by bus every day to Santiago to lead tours. I am inspired by these stories of hard work. As we began the drive back to Indomita Winery, Elton John played. Every time I hear Your Song, I think of Eric singing it to Jen at their wedding, and this makes me happy. It was about 3 pm when we arrived at Indomita Winery, so be sure to take a snack if you do this tour as lunch will come very late. The nine tourists sat together and enjoyed good conversation (mix of Spanish and English), wine and food (my salmon was great) backed by live saxophone. I was very pleased with our group. The Spanish family travels a lot and interestingly offered several recommendations for US national parks. The winery is a modern white and glass building on a hill with great views over the vineyards and valley. After a long lunch, the wine tasting included in the tour began. Most of the group sat in a nice room, while Jenni and I were relegated to the front patio as the only two requiring English. Score another for the ethnocentric, monolingual Americans. Our punishment was an outdoor, private tasting. First was a white blend of late harvest Gewurtztraminer and sauvignon blanc. Next a pinot noir that I liked a lot. Our pourer explained that pinot is sort of in between typical white and red, hence it is known as the Michael Jackson of wines. We finished with a leathery cab. I had high expectations as I recall years ago Streiff told me that his parents enjoyed their trip to Chile and its wine, and those Streiffs know travel and wine. I was not disappointed. It was a great day and I hope to return one day to visit more of Chile’s wineries. This entry was posted in Chile, South America, Uncategorized and tagged Chile, Valparaiso, Vina del Mar, wine on December 5, 2013 by aleavitt77. Hello from Hong Kong!! And now, back to Chile…We spent two wonderful days in and around Santiago (I will cover the “around” tour part in a separate post). It is a large city but very manageable and relaxed. 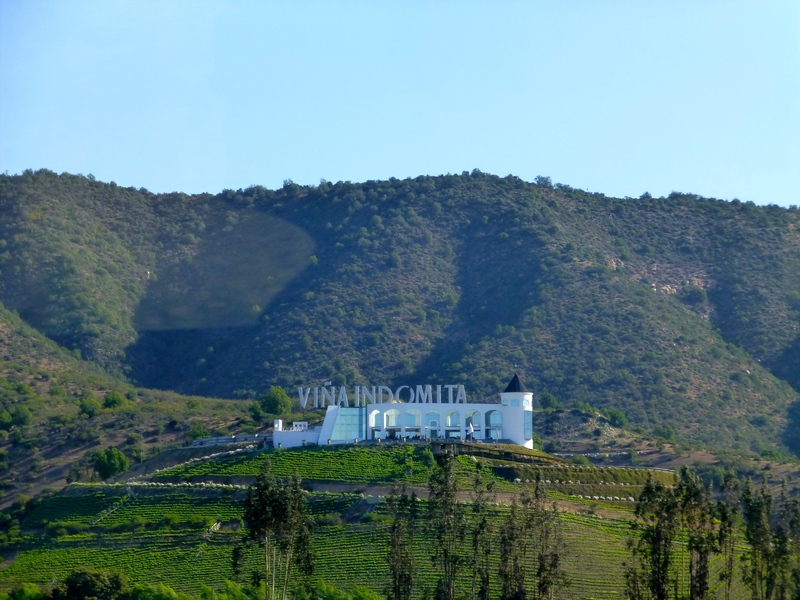 We arrived Friday evening, walked around all day Saturday and did a full-day tour on Sunday to Valparaiso, Viña del Mar and the Indomita Winery in the Casablanca Valley. Highlights in Santiago included hiking up Cerro San Cristobal, walking around the Mercado Central/Vega and Plaza de Armas and wine at Bocanariz. Valparaiso was enchanting with its colorful buildings and alleyways set amidst the hills right on the sea. Our trip down was long but smooth, though one of these days I need to actually visit Panama instead of just flying through. I think have been in that airport for at least three roundtrip journeys in the last few years. 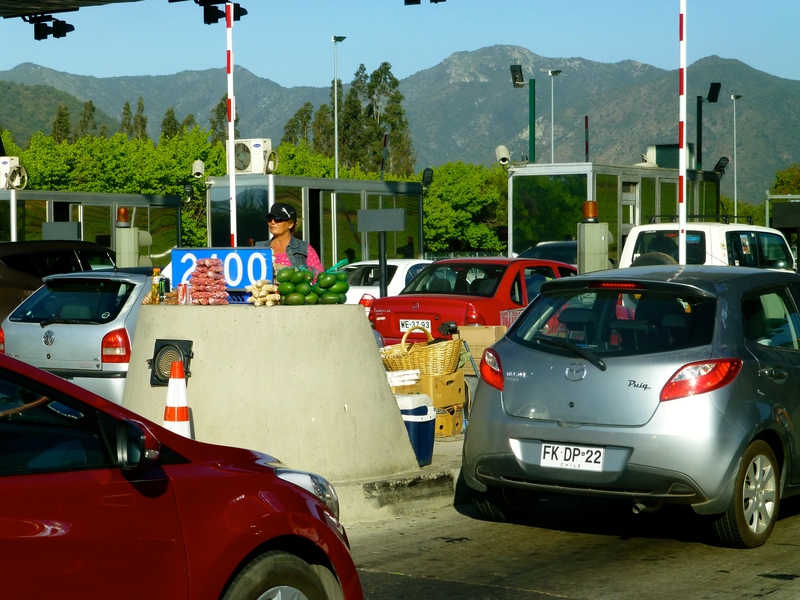 The greeting in Chile is less than cordial as Americans must pay $160 per person to enter. Be sure to do so before entering the immigration line. This is called a reciprocity fee, I guess because America does not roll out the red carpet for Chilenos. The entry stamp is valid for the duration of your passport, so we are thankful each of us has 9-10 years remaining validity. There is an ATM just beyond customs. An official taxi costs 17k pesos (the exchange rate for our visit is about 520 pesos per US$) and with no traffic (and excellent roads everywhere we’ve been) we arrived at Lastarria Boutique Hotel (LBH) in 20 minutes. LBH’s location is superb. Lastarria is a central neighborhood filled with cafes, bars, restaurants and boutiques. LBH is on a quiet side street just a block or two from Parque Forestal and the happening Lastarria street. Our junior suite (#12) was pricey and not huge but well-decorated with a nice bathroom (modern + rain shower) and large balcony with quality lounge furniture. Breakfast (fruit, pastries, eggs to order, fresh lattes and cappucinos) is served in an attractive space on the second floor or on the terrace overlooking the courtyard with pool. LBH is stylish without trying too hard. At reception is a bowl filled with miniature scrolls each concealing a quote. Mine: “The use of traveling is to regulate imagination by reality, and instead of thinking how things may be, to see them as they are.” – Samuel Johnson. Jenni’s: “Como todas las drogas, viajar requiere un aumento constante de las dosis.” Translated as “Like all drugs, travel requires constant increasing doses.” – John Dos Passos. If only I could relate. 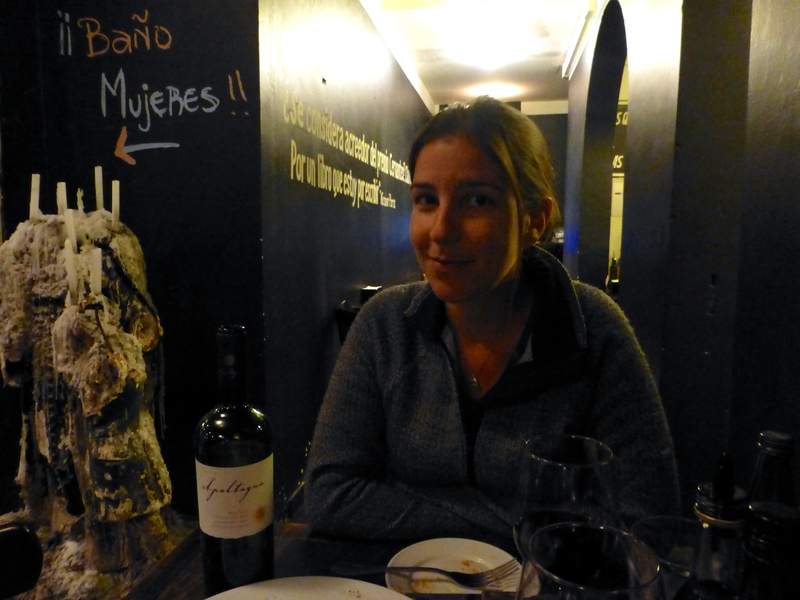 Friday night we walked to Bocanariz which is a very popular wine bar and restaurant on Lastarria. They offer flights and 35 wines by the glass and an array of tapas and larger plates. We loved the wine, especially the red Apaltagua Enervo Reserva 2011 Carmenere from Colchagua Valley. The food was good and the scene energetic yet refined, with a young crowd of friends and couples. We sat in the middle/bar room at a high wood table with clean lines and carabiners for hanging a purse. Juan Pablo memorized our order from the English menu. The herringbone-esque scuffed wood floors evoked an eccentric ballroom past its prime. Walking home after 1 am we felt entirely safe, as we did at all times in Santiago. The violent crime rate is very low, much moreso than your typical US metropolis. Saturday we walked through Parque Forestal, passing the Museo de Bellas Artes and a Veet-sponsored yoga session. The Mapocho River rushing through the city is brown as Willie Wonka’s but probably does not taste as good. First we visited the Mercado Central which is moderately sized and loaded with seafood vendors, plus some fruit stands and several dining options. We heard El Galeon may be the best of these. Seafood is prevalent in this narrow nation with a coastline of nearly 3k miles. 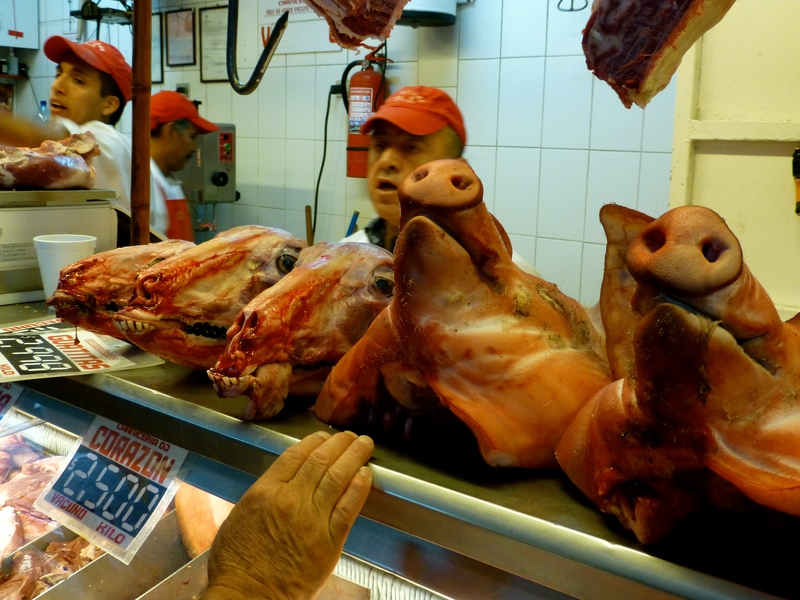 Nearby Mercado Central are the Mercado de Abastos Tirso de Molina and the Vega with meat, produce and goods. The former has many dining options. We got fresh fruit smoothies for 1k pesos each at a stand run by a guy from Phi Phi, Thailand. Water/ice in Santiago is generally safe to drink. 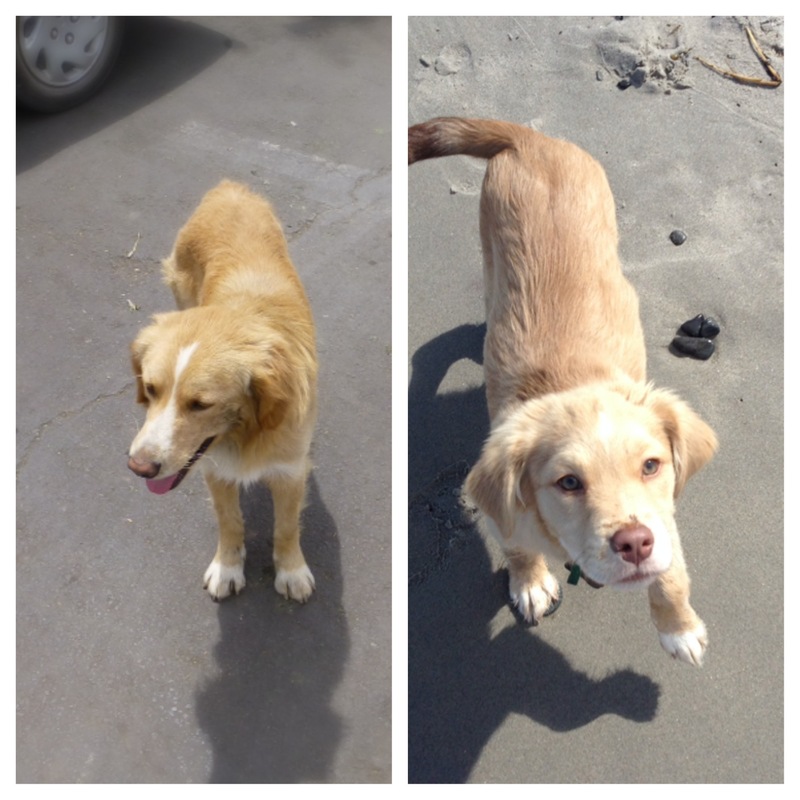 There are lots of stray dogs here and most appear very healthy. We heard neighborhoods often care for them. One looked exactly like Ryder. I can’t tell which is Ryder?! The markets are surprisingly relaxed, and I felt this way about Santiago in general. The population exceeds 5 million but it feels mellow. While there are vestiges of a developing country, it is generally more akin to Buenos Aires or Madrid than Rio or Andean cities. Prices are surprisingly high (except for avocados and wine) and most restrooms have those fancy dryers that make your hands look like a Shar-Pei. Just to avoid any confusion, the markets seem relaxed, but I do not mean to suggest they are the same as what you might find in the US. When was the last time you saw something like this in America?! 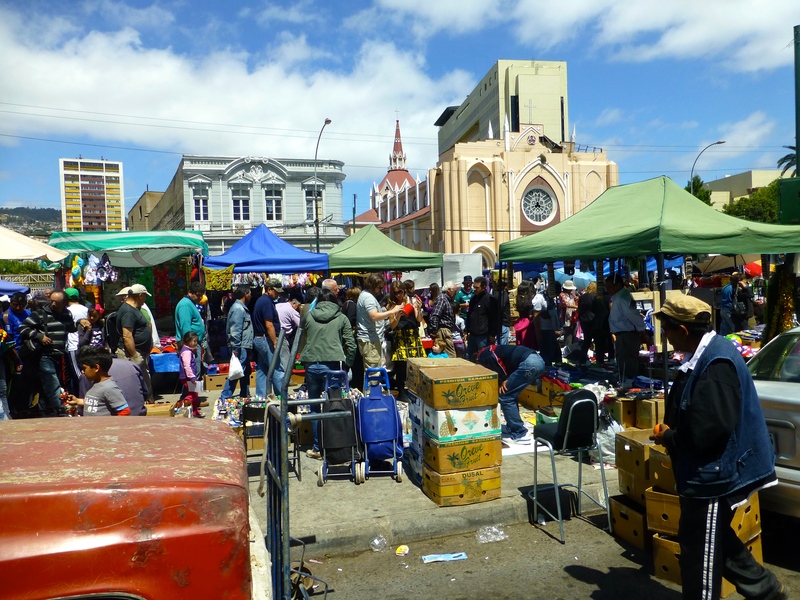 From the markets we walked a few blocks on the pedestrian-only Paseo Puente to Plaza de Armas, the heart of the city. There were some street performers, a fountain with kids swimming, Santiago’s main church, the national post office and the natural history museum. A parade for premature babies (who knew?) preceded by batukada drummers livened the scene. 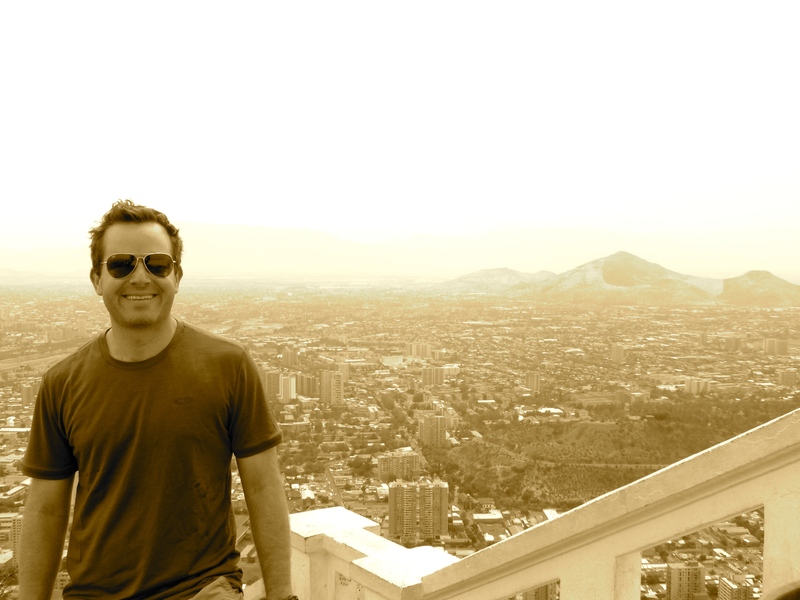 We walked through the colorful, bohemian Bellavista neighborhood to the base of the funicular at Cerro San Cristobal. A road then walking / mountain bike path ascend to the left and 45 minutes later we were at the Virgen Maria statue enjoying great views of the city and surrounding Andes mountains (though air quality is sub-optimal). Food and beverage is available. For 1,950 pesos each we descended on the funicular past the zoo. The Aubrey Boutique Hotel is right here and I believe Pablo Neruda’s house is, too. Plaza Camilo Mori had another public piano, confirming this is an international trend. Constitucion and Pio Nono streets are lined with bars and restaurants, and the Patio Bellavista has many more plus shops, albeit expensive and touristy. Back in Lastarria we had a very late lunch at La Junta in a courtyard-like area, the same place as Nolita where we met Matt for wine and tapas the following night. 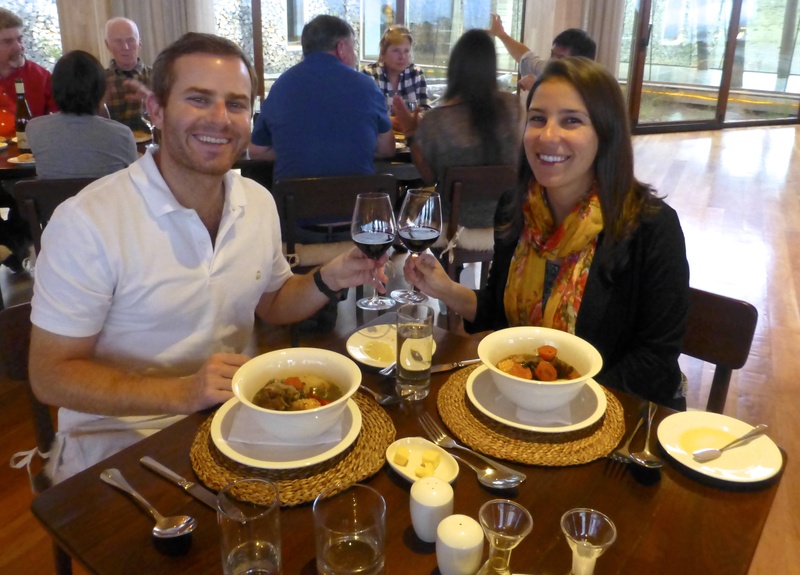 The food at La Junta was unremarkable, but we did try our first pisco sours of the trip. We split a Pisco Pica and a Pisco Normal, the former being the more Peruvian version and the latter more Chilean. The Pica has egg white and the lemons from Peru are smaller and more sour, versus the larger and sweeter lemons of Chile in the Normal. My pork sandwich was big enough for three, so I ate one-third and gave the rest to an appreciative old man begging in front of the church. 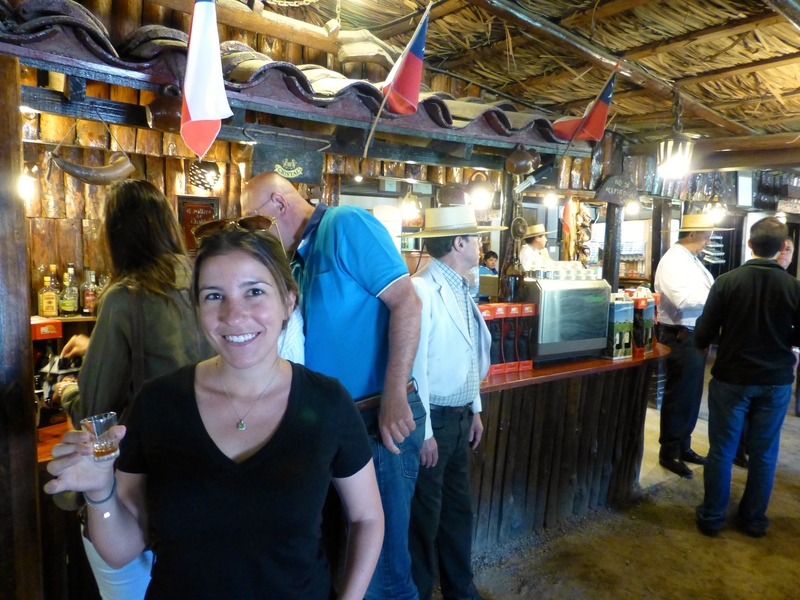 It was on tomorrow’s tour that we learned about pisco, but since we are on the subject…It is alcohol made of grapes and may be 120 proof before water dilutes it to about 80 proof. There seems to be some controversey regarding what is proper pisco, and our guide said there is a controlled appellation regime (like champagne) where pisco must come from a few valleys in Chile. On other Chilean beverages, chicha here is made from grapes instead of corn as in Peru and elsewhere, and the terremoto (earthquake) is red wine with pineapple ice cream and pisco. Sadly we missed this one. At night we had hoped to visit the Vitacura neighborhood for rooftop drinks at Noi, but instead we stayed closer to home. Matt made us feel much better about this when he said that Vitacura is very nice with fancy hotels and restaurants, but it lacks the character found in Lastarria, Bellas Artes, Bellavista, Providenica, etc. Character is not lacking at The Clinic, a lively and well-known political satire bar in Bellas Artes named for the London medical clinic where Pinochet was captured in 1998. The ribs we shared were good, and even better was the picante traditional puree which looked like sweet potatoes but I am not sure of the actual ingredients. It cost about $45 with a bottle of Carmenere. The temperature was about 80 degrees during the day but it cools at night. I thought it was funny each time one of us said “it’s chilly,” and Jenni was amused that I felt this way. While we did not come close to seeing the whole city, it seems to me that staying in Lastarria or the neighborhoods surrounding it would be your best bet. These include Bellavista, Bellas Artes, and Paris-Londres with its cobblestone streets. My mom’s friend Margery recommended Opera restaurant in the area and her daughter, who lives in Santiago, also noted Tambo (Peruvian) and Mamboleta bar. Matt lives in Santiago now and in one of those small world instances that I relish, we connected because he is from Longmeadow and his long-time girlfriend Liz used to work with Alper. Matt was super helpful and wrote us the email below (edited by me to avoid some repetition as we took much of his advice!) in advance of our visit, and also mentioned Manquehue for a more serious hike in the city, the rooftop bar at the W for good views and scene, and Emporio La Rosa for creative ice cream flavors. -Very tough call re: wine tour, but I’d have to say it’s worth it. A friend of mine runs a hugely popular biking tour of vineyards called La Bicicleta Verde. They offer half-day trips, so you could still get the best of both worlds! If you want to do a traditional wine tour of Casablanca (the wine region), I hear that Uncorked is a really good company– a lot of people who do it continue onto the coastline to visit Valparaíso, a really artsy, bohemian port city. -Astrid y Gastón for fine dining. Gastón Acurio is a Peruvian chef that’s known for having the best line of high-end restaurants in Latin America. -The Clinic…I would recommend it as a lunch spot. -Cuatro y Diez is a great low-key, intimate bar in Bellavista where you can go to see live music (mostly spanish folk music). They start playing around 11pm. -Café con piernas (Coffee with Legs) is a tradition in Santiago. There are a number of standing-room-only coffee shops in Lastarria and Bellas Artes where you’re served by women in short skirts. It sounds chauvinistic, but people aren’t phased by it here (a lot of the customers are actually women). -As far as museums go, there are a lot to choose from, but I’d say that Museo de la Memoria is the only one worth going to if you’re only spending a couple of days here. You can find much better art in other Latin American cities, and Museo de la Memoria gives you some really interesting insights into Chile’s recent past under the military dictatorship. This entry was posted in Chile, South America, Uncategorized and tagged Bocanariz, Chile, Santiago on December 5, 2013 by aleavitt77.